It’s still very early in San Leandro’s campaign season, but an endorsement result last week might be signaling that District 2 Councilmember Deborah Cox is in for a tough re-election campaign this fall. 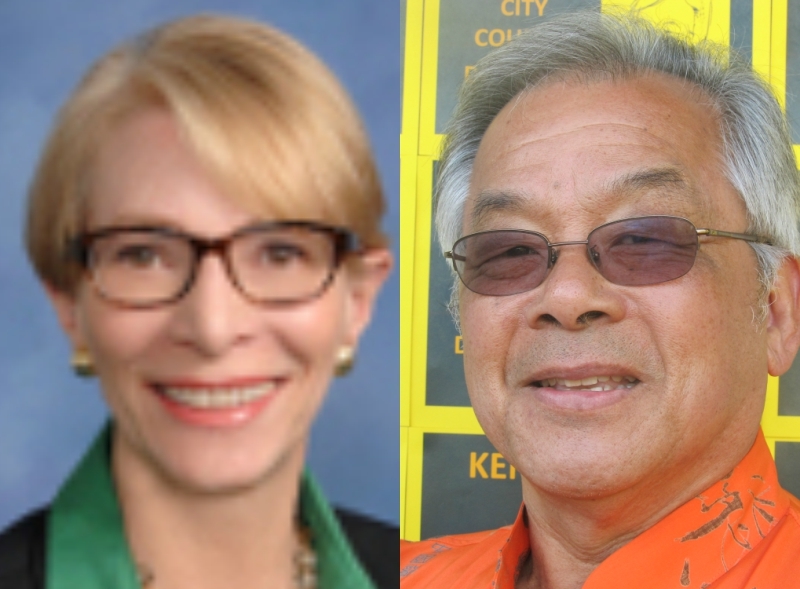 The San Leandro Democratic Club voted last Thursday to endorse Cox’s only current challenger, Ken Pon, a former two-term San Leandro school board member, but somewhat of a political vagabond in recent years who ran and lost in the 2014 race for the open seat won by Cox. Pon, who won 21 percent of the first places votes in 2014, didn’t even reach the final two in the Ranked-Choice voting race that year. Cox earned 42 percent of first place votes and defeated former San Leandro school board member Mike Katz-Lacabe in the final round, 65-35. Pon currently chairs the city’s Planning Commission. Though Cox is viewed as a moderate on the San Leandro City Council, some of her comments Thursday night on the issues of surveillance and the city’s homeless raised a few eyebrows. Cox told the club she would support placing surveillance cameras on both ends of East 14th Street–the main San Leandro artery connecting Oakland and Hayward. Later, in response to a question about combating San Leandro’s homeless problem Cox appeared to criticize Oakland’s handling of its own issue. “We’re not Oakland,” she said, while also lauding San Leandro for providing stable homes for 25 individuals. Cox later told the East Bay Citizen that her comments were not meant to denigrate Oakland, but instead to highlight San Leandro’s success in helping the homeless in the city. San Leandro’s municipal elections, held in November, are still a long way from solidifying. Stephen Cassidy, a former San Leandro mayor, for instance, may be eyeing a challenge to Cox. His candidacy is viewed as a potentially formidable impediment for Cox’s re-election. However, Cassidy is also rumored to be interesting in running for mayor. Further fueling speculation about Cassidy’s interest in returning to City Hall is a recent uptick in his rhetoric involving public employee pension reform, an issue he deftly used to registered an upset victory in the 2010 mayoral race. Cassidy has also led a group of property owners in District 1 to protest the construction of a four-story building in the Estudillo Estates neighborhood of San Leandro. San Leandro Democrats, however, may have also been in a contrarian mood last week. The club voted to endorse progressive candidate for Alameda County District Attorney, Pamela Price, over the incumbent Nancy O’Malley. Posted in 2014 Election, 2018 election, Deborah Cox, East 14th Street, endorsement, homeless, Ken Pon, Oakland, san leandro, san leandro city council, SLD1, Stephen Cassidy, surveillance cameras. Bookmark the permalink.